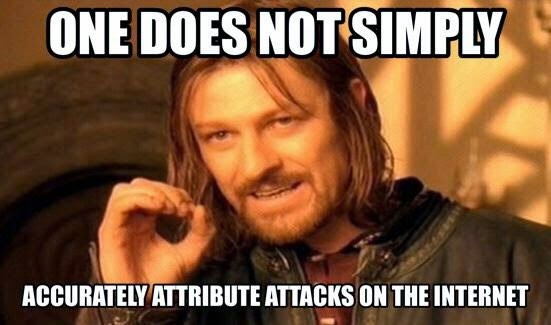 Thanks to George V. Hulme for tweeting this meme expressing doubt that we can ever figure out who committed an online attack with any accuracy. As @thegrugq has said, the attackers control too much of the forensic information we'd have access too in the online world, they can easily deceive us. Now, if there's offline evidence about who did what, that could be a lot more compelling than pointing at a map and saying "we saw their IP address(es) in traffic related to the attack".